"I found The Karma Club by searching for a nudist-friendly murder mystery. It exceeded expectations: I hosted it at Serendipity Park nudist resort last year. I can't show you all the pictures, but suffice to say the hippie theme was a good fit for us. We are looking forward to the next Freeform mystery coming up soon!" "I wanted to host this one since The Karma Club came out. I was really excited about a 60s theme party. Everyone had a fun time, and it went great. The writing to this one is superb and, to everyone out there, Do this one!" "15 friends and I just did The Karma Club at the weekend, and had an absolute blast as usual (it's our 5th freeform, and fourth of yours!)" "The Karma Club was the best one so far!" 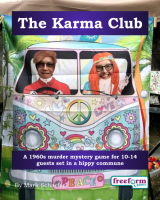 The Karma Club is a dinner party murder mystery game for 10 to 14 guests and a host – download the free introductory pdf file. Join us in a thrilling evening of love, peace, music and murder You will be in the middle of the action and it will be up to you to wheel and deal with the other guests. Can you achieve your goals, keep your secrets hidden and survive The Karma Club? It's up to you. The Karma Club lasts for about four hours and is suited to an evening. It is often played over a meal – a finger buffet if possible to allow guests to circulate and talk in private. The free introductory pdf file contains an introduction to the game, a cast list of all the characters, and a copy of the Wells River Gazette – plus details of how to buy the game. Abbot "Abbie" Rosen – Founder and leader of the commune. Axel Maddox – Drummer, and prankster of the band. Bobby Stank – Head roadie, Marvin Stank's brother. Flower Mason – Commune member. Guinevere Stone – Commune member and mother of 18-month-old Sunshine. Jackie Nichols – Local folk singer, opening act for Marmalade Skies. Judy Stank – Bass, and Marvin Stank's widow. Lee Melvick – Lead guitar, the party-boy of the band. Moonbeam Baxter – Recent commune member. Pony Noonan – Long-time member of the commune and something of a rebel. Sam Spears – Executive with Groovytunes Records. Sandy McVee – Wells River citizen, avid Marmalade Skies fan, owner and sole employee of "Sandy's Memorabilia & Collectibles". Snow Diamond – Commune member. Suzy Dickerson – Lead vocals and Marmalade Skies' songwriter. The Karma Club is unlike many murder mystery games. Although the game starts with a murder, most of the characters have more important things to do than to investigate it. And the killing may not be over – it is unlikely that everyone will survive the remainder of the evening! The Karma Club costs £20.00 (GB pounds) or US $29.99. You can buy it in either currency, from anywhere in the world, as you prefer. The price will be converted back into your own currency for you, at today's exchange rate. We offer a Cast Iron Guarantee on all our murder mystery games. If you're not completely satisfied with The Karma Club then please let us know within 30 days and we will refund you. See our full terms and conditions here.